When spring comes around I promise that we will change our wintery, comfort eating ways. We will eat fresh produce, lots of vegetables and salads and cut down on the carbs. 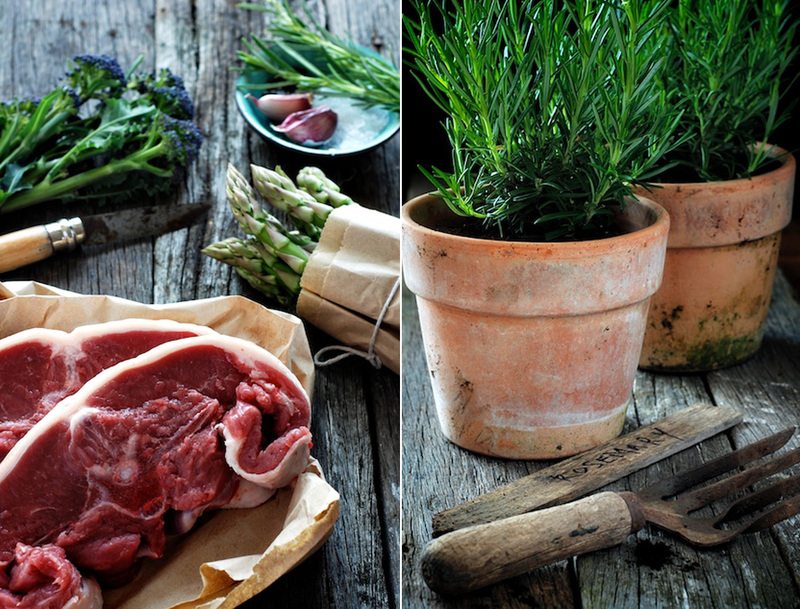 With this in mind I bought some barnsley chops of spring lamb and the first British asparagus of the season. I also replenished our rosemary plants that didn’t survive the frosts. After nearly a year of waiting our purple sprouting broccoli was producing magnificent violet florets so I picked plenty of that too. I marinated the lamb with garlic, rosemary and olive oil and seasoned it ready to grill. It was all looking so very healthy and virtuous that I could almost hear the pounds dropping off and hitting the floor. Then I fell off the wagon and made an unctuous butter laden hollandaise to dip it all in. This kind of defeated the point of the exercise, but damn it was good. Who knew hollandaise was this easy and didn’t tell me? Melt the butter in a small pan. Bring the vinegar and lemon juice to the boil in a second pan. Blend the egg yolks and salt in a liquidiser then, whilst still mixing, pour in the hot juice and vinegar. Whilst the motor is still running slowly trickle in the melted butter as the sauce thickens. Dip your healthy vegetables in the sauce…and smother the lamb chops in it too. Beautiful photos! That lamb looks wonderful. I did a Hollandaise recently, they’re worth falling off the wagon for. Life’s too short not to eat Hollandaise. 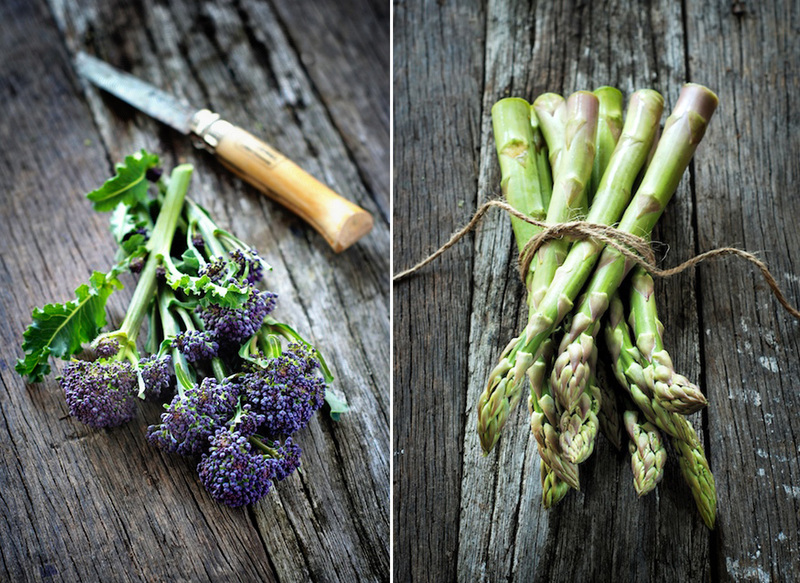 I am enviously looking at that asparagus and purple sprouting broccoli – I wish I could reach in and grab it from the page. Beautiful pics – everything looks so fresh. Loving the photos. 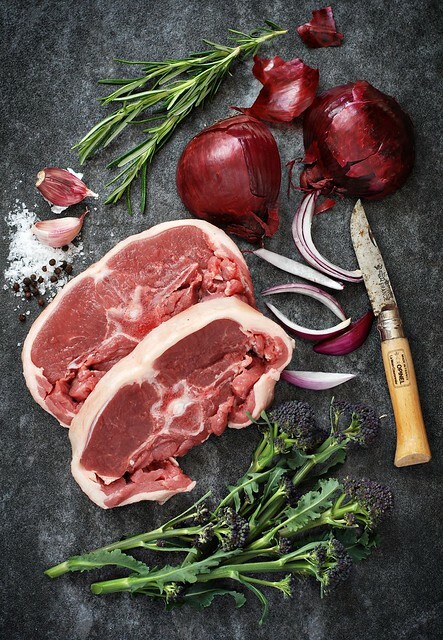 Lamb is one of my favourite meats – asparagus, purple sprouting broccoli and hollandaise just sounds divine as a combination. Wow, looks great. 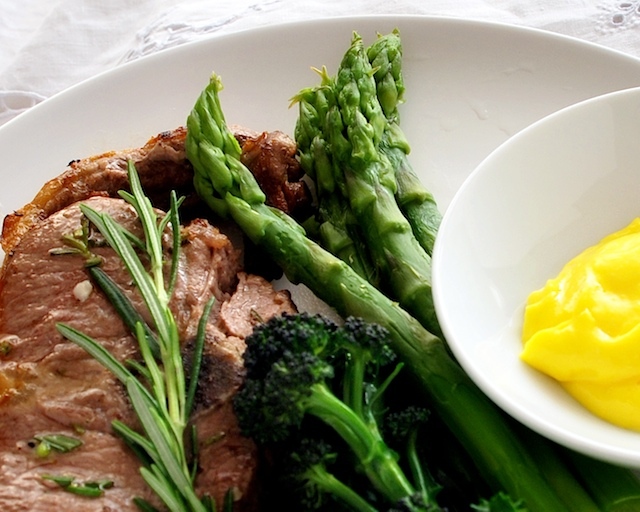 I’m cooking slow roasted shoulder of lamb later…might try some cheeky Hollandaise! You make me want to learn how to cook …to really cook. I lov e this sauce …. now to try this!